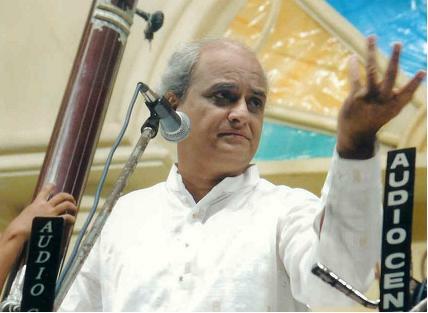 Pandit Ulhas Kashalkar has received training in the Gwalior, Jaipur and Agra gharanas. 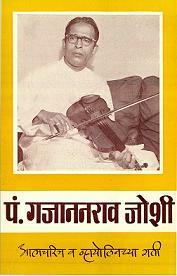 He studied principally under Pandit Ram Marathe and Pandit Gajananrao Joshi. He received his first lessons in music from his father N D Kashalkar, a lawyer by profession and an amateur vocalist and musicologist. He went on to study music at Nagpur University, topping his post-graduate class. Around that time, he trained under Rajabhau Kogje and P N Khardenavis. Ulhas Kashalkar undertook a long period of tutelage under Pt Ram Marathe. Endowed with an exceptionally melodious and sensitively adaptable voice, Ulhasji’s music recitals exemplify the rigorous traditional training that he has received from his gurus. But even while adhering steadfastly to the grammar of his Gharana music, he makes it aesthetically appealing even to his lay listeners. His style(Gayaki) of delineating a ‘raga’ is authentic as well as imaginative. His ‘taans’ are remarkable in their variety. Above all this, his supreme sense of artistic proportion leaves his listeners craving for more. The supreme authenticity of Ulhasji’s musical renditions creates and strengthens our faith in the future of Hindustani Classical Music. He has the ability to mix or completely separate the gayakis of Agra, Gwalior and Jaipur. Ulhasji’s reputation and popularity as a musician has now spread worldwide. His recitals have evoked a tremendous response in the Middle East, Europe and America. Many renowned music companies in India and abroad have brought out CDs and audio cassettes of his music. Most characteristic features of his style can be traced to Gajananbuwa's vocalism (Gayaki).